Flip Flop Fantasy is a neon pinky/coral. 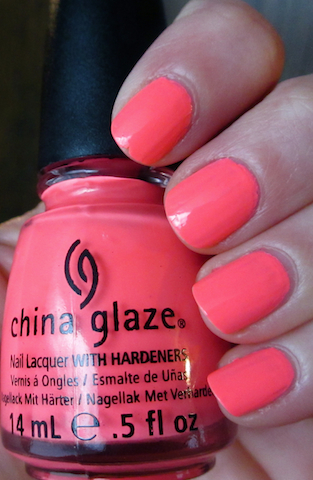 I also have China Glaze Shocking Pink and that is more of a true neon pink without the coral. I enjoy the end result, but this was very streaky to apply. This is 3 coats with a top coat to make it shiny (I think all neons are matte on their own). It was hard to capture the true brightness of this polish - I actually had to take the pictures in the shade. yes, it is. I am sitting at work right now and it feels like I have lights on my nails! lol. This polish is such a pain to photograph and get accurate, but you did a great job! It's such a fun summer color... I layered it over a coat of white which made it look so vivid and bright. LOL, "obnoxious" is the PERFECT word for it! My all time favorite neon. I'm more of a brights kinda girl, but something about flip flop fantasy is just so great. I love it. Have you tried Shocking Pink??? After wearing Flip Flop Fantasy today, I think I've decided that I like Shocking Pink a little better.